In a previous post I mentioned that I had discovered that my great-grandparents José María Alvarado and Jesús García were married in San Diego on 10 Sep 1895. But where in San Diego? They had apparently met in Ensenada, and we do not yet know why they chose to be married in San Diego. The marriage certificate was signed by a “P. Lennon, Catholic Priest at San Diego.” I enlisted the aid of the Archives of the Archdiocese of Los Angeles. Up to 1936, San Diego was a part of the Diocese of Los Angeles – San Diego, which would become the Archdiocese of Los Angeles in 1936. The archdiocesan archivist informed me that Rev. P. Lennon was at that time assigned to St. Joseph Church, San Diego. St. Joseph Church was founded in 1874. 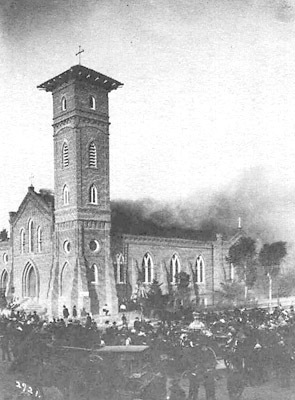 The first St. Joseph Church is pictured here engulfed in flames in 1913. Sometime thereafter it was rebuilt, and today it is the cathedral of the diocese of San Diego. So the church where my great-grandparents were married was the predecessor of today’s cathedral in San Diego. Stoltz, Chávez, Dunham, Alvarado, Luján, Rocha, Ivans, García, Verdugo, Marín, Stricker, Cuaron, Balderas, Springston, Todd, Telles, Tamayo, Moraila and more. Names, places, and events mentioned on this blog. Where in the World Was Willard Wood? Yvonne J. on Where in the World Was Willard Wood? If you have information, stories, photographs or anything else you'd like to share to help with this project, contact me! © 2019 Stoltz Family Genealogy. Theme by XtremelySocial and Blacktie.